Filmmaker Mark Steven Johnson has a number of impressive films under his belt, though the romantic comedy and heist film Finding Steve McQueen might have posed the biggest challenges he has faced as a director. 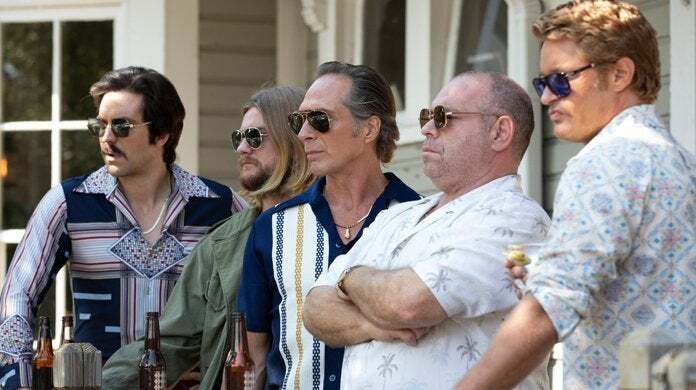 The film is based on a true story when an unlikely gang of thieves attempt to steal $30 million in illegal campaign contributions from President Richard Nixon's secret fund, the plan quickly goes sideways, prompting the biggest manhunt in FBI history. While Johnson has a diverse list of credits, from character-driven comedies like Grumpy Old Men and Simon Birch to action-oriented comic book films like Daredevil and Ghost Rider, the filmmaker had to find a way to blend humor, drama, romance, and action while also honoring the true life events that inspired the film, making for one of the more unique and entertaining movies of the year. ComicBook.com recently caught up with Johnson to discuss his approach to the film, balancing fact with fiction, and acquiring the perfect ensemble to pull the film off. ComicBook.com: The true story behind this film feels too bizarre to have actually happened. Had you been familiar with the actual heist? Mark Steven Johnson: I had no idea. I read the script, and I looked it up, and I kept thinking, "Oh, that can't be true. That can't be true." And it all was. Like, "How did I not know about this?" It's crazy isn't it? If you weren't aware of the true events, how did you get involved with the film? I didn't really have any interest in doing a heist film at all, and so when it was sent to me I thought, "Ah, I don't want to do another bank robbery movie. There's been a million of them." And at first I read about it, and there's that great scene in the beginning where Harry sits down with Molly and says, "I'm not who you think I am." And you flash back throughout the story, and you have all these multiple timelines going on, which I thought was really interesting. And then I started reading about the case, and I thought, "Oh, that can't be true." And then I look it up, and I see that it was. We, obviously, took creative license with the film, but all the most amazing parts of the story are true. You would think that it couldn't be. The fact that this gang of robbers from Youngstown, Ohio, bank burglars, decided to try to rip off President Nixon is fascinating. And then the fact that they broke into the same bank three nights in a row, Friday night, Saturday, and Sunday night, I'd never seen that before, and that was true. And how they did it, how they got caught when they didn't run the dishwasher, and Harry meeting up with Molly under an assumed name, John Baker, and this happens to be the daughter of the sheriff. All those amazing parts of the story are absolutely true. And I was like, "How come we've never heard of this before?" I felt like you did. I was just like, "Why hasn't this been made into a movie before?" So, it was great to be the one to tell the story. As you mentioned, this is a heist film on paper, which we've seen countless incarnations of, but this film has much more humor and romance in it than what audiences would likely expect. How did you find the balance of all these various tones and genres? Well, it's tricky because when you're doing a movie like this we know what a heist film looks like, and we know what a romantic comedy looks like, and we know what a screwball comedy looks like. So, when you try to combine it, you're right, tone is the toughest thing, because I'm an idiot I love comedy. That's how started with Grumpy Old Men, and I just always think, "You know what would be funny?" And sometimes I have to pull myself back, "This isn't a scene about being funny." And [star] Travis [Fimmel] is the same way, and most people know Travis from Vikings, but he's a screwball. He's very funny, and he's always the one to push things. It was his idea, when we were doing the [opening] diner scene, where he was like, "Wouldn't it be funny if I'm trying to avoid her questions, and so I just keep eating desserts?" I'm like, "Yeah. That would be really funny, and guess what? You're going to be eating cake now for the entire day." It got to him later. He's all bloated and chocolate on his face he's like, "I don't feel good. I can't believe I got to keep doing this." Tone is an interesting one. It was definitely a balance, because there's definitely some very broad comedy, but there's a lot of heartfelt stuff too, especially between Harry and his brother Tommy that I thought was really lovely, and between Harry and Molly. So, it's a tricky one. It's a tricky one, but it's fun. It's a little movie. It's a five-million-dollar budget, and when you make a movie like that you think, "Okay. That's kind of the trade off you get." When you're making Ghost Rider you have a 100-million-dollar budget, and everybody has an opinion, everybody wants to get involved, everybody is pulling it this way or that. But, when you're making a little movie you're like, "That's the trade off." We don't have any money. We're not going to make any money with this movie so let's have some fun. Let's try some things. Since it is such an intimate movie, the chemistry between the cast is what sells the whole movie. How did you go about finding the right blend of performers to get a specific dynamic? It's always a bit of a rollercoaster. Because, again, when you don't have a lot of money, people have to fall in love with these characters. No one's getting rich making a movie like this. So, you're just hoping to get it to people that will look at it, and see what you saw in it. And that's how I felt with Rachael [Taylor], for sure. I got so lucky with Rachael. Oh my God, she's fantastic in this movie. And [William] Fichtner is such a pro, and, of course, Forest [Whitaker] is Forest. He's an Academy Award-winning actor, and he's such a gentleman, and he has such dignity when he's on screen. I always say, "It's kind of like having a really high-performance race car," with people like that. You don't have to do much. It'd be great to take credit for great performances, but you really don't. Really you sit back, and you let them do it, and you have conversations about it, and then you make little adjustments. And that's how I felt with all these actors. They were just so ... All of them. I'm fans of all of them. And to direct a movie as a fanboy is kind of the greatest thing. With a cast like that, I'm sure it's just as entertaining hanging out on set and exchanging stories as it is making the movie. You go out to dinner with the cast, or whatever, you never get stopped so much in your life as you do with William Fichtner. Everybody has a favorite Fichtner movie. They'll just point at him and they'll be like, "Dark Knight, and oh man ..." I mean, people start freaking out. Oh man, something about Bill's face is so unique too. He's so lean and intense looking, and people see him they just have to start shouting out his movie credits. It's the funniest thing. And if someone ends up yelling "Armageddon," you don't know if they're praising the movie or trying to warn you about something. Exactly. Is that a warning or a compliment? With the film being based on true events and the film's final moments offering information about what happened to the characters after the film, did the individuals the movie is based on have any input on the film? Even though it's "inspired by" the true story versus "based on," it's very close to the true story. Like I said, all the most outrageous things are all true. Where it got tricky is, when you're dealing sometimes with a crime like this, not everybody wants to talk. Even though all these years have gone by some people are proud of their involvement, and even boastful of how smart they were to get away. Other people don't want to talk at all, and there's always disagreement among the gang of who did what. Some people say, "Oh, I did everything, and everybody else didn't do anything." And someone else will say, "No, that guy didn't do anything. He was just along for the ride." And then some of it can be very sensitive. For example, Harry, our hero, there was a scene with Harry and his mother and father showing his home life, and Harry said, "Please don't put my mom in the movie." And out of respect for Harry, of course, I said, "Of course. We'll just cut that scene." That's why you never see Harry's home life. You assume his parents have passed away, or that he doesn't have a relationship with them, because it's just him and his Uncle Enzo, Fichtner. Or we had his character Molly's real name, and Harry said, "Please don't use her real name." And so, with all those considerations the producer said, "You know what? We have Harry's story let's tell Harry's story. And other names we'll replace in places." You want everyone to have their chance to tell their version of the story, whatever it is. So, this is our version, and that's why we decided to do it. Finding Steve McQueen lands in theaters, On Demand, and Digital this Friday.